Need some troubleshooting about ChIP - Is it a problem with the antibody? I'm visiting this forum for years, it is of great help. Today, I have a persistent problem with my ChIP experiment. I will detail my purpose, protocol and hope you will be able to help me understand what is wrong. And I'm sorry for the long post! I'm trying to study the recruitment on DNA of a coactivator (let call it X) for a nuclear hormone receptor (NHR). My model is the liver from mice either wild type or knock-out for the coactivator X specifically in the liver. The coactivator activity of X over this NHR has been extensively characterized and the liver-specific KO validated through multiple approaches. My ultimate experimental purpose is to realize the ChIP-sequencing of the coactivator X in WT mouse liver, and the one of the NHR in both WT and coactivator X liver-specific KO mice. But to be able to do that, I have to pass the ChIP experiment. I perform the ChIP protocol on liver directly after its removal from the mice. I've already optimized the PFA cross-linking and sonication steps. FYI, I mince the liver in small pieces, wash it in PBS, fixe it for 10 min in 1% PFA solution (+ PMSF +DTT), quench PFA with glycine for 5 min, wash it thrice with ice-cold PBS, lyse with a dounce [...] and shear the chromatin using the Bioruptor Standard for 45 cycles (1 cycle = 30s "on" + 30s "off"), high intensity. For the IP, I first pre-clear the chromatin using protein A-coated magnetic beads and incubating overnight (rotation, 4°C). Then, I pre-mix the coactivator X antibody with protein A-coated magnetic beads for 2-4h (+PI +BSA). As a IP negative control, I use a No Antibody condition. Then, I remove the beads from the chromatin and add the pre-mix antibody-magnetic beads. Incubation overnight (rotation, 4°C). Next morning, washes and decross-linking at 65°C overnight after adding salt. Finally, RNAse digestion, proteinase K digestion, DNA purification and qPCR using primers encompressing various validated genomic targets (or negative controls). Now, my problems: in qPCR analysis, I don't obtain any significant and reproducible difference between the WT and the coactivator X KO samples. Also, in many cases, I don't observe a significant difference between my "No antibody" IP and the ones using the Coactivator X specific antibody. One thing that I hadn't test at first is the optimal quantity of the Coactivator X antibody per IP. I've just realized the experiment and you can see a qPCR results as a graph attached. In this experiment, there are two biological duplicates. 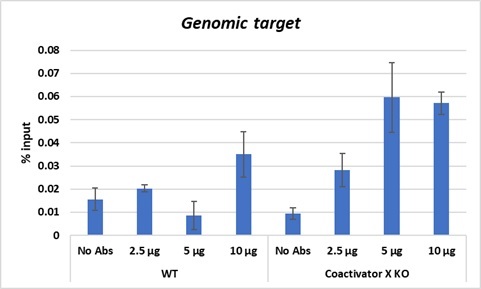 My analysis is that there is no significant differences between the negative control No Abs condition and any of the Coactivator X antibody ones. Second, there is no difference between the WT and the KO samples. The results are the same (same amplitude and scale) if I analyse a negative control genomic region. I analysed other positive and negative regions, same kind of results. For now, I'm beginning to think that the antibody is not good. Or that my IP conditions are not optimal. Or else. Why am I using this antibody? Because I've already performed the analysis of the coactivator X genomic recruitment in a different model (cell model) and that the results were significantly conclusive (and are almost published). I've spent a lot of time trying to make this experiment works, and I'm running out of ideas. I really hope that, with a fresh look, a clear and specialist mind, you will be able to help me. Of course, I can provide any further detail that could be useful. I will feel very thankful for any comment and advice! Very few antibodies are suitable for CHIP, has the one you are using been validated for CHIP? Does the antibody detect the native form of the protein? Does the antibody work on PFA fixed specimens? Note that the liver is full of RNAses, so getting intact RNA out of liver is relatively difficult to start with. Perhaps look to see if you can amplify the RNA after incubation just in the buffers you use for the process and over similar time-periods. You should also check the quality (bioanalyzer if possible) of the RNA you get out before the cDNA preparation - perhaps it is being damaged too much for your cDNA step to be efficient, or you are not using the right kit to covert to cDNA (try random hexamers rather than oligoT priming). About the antibody: as I said in my first post, I've used the same antibody in ChIP experiments performed from another model for another project. The two models, even if they are very different, are both from mouse. So it's the same coactivator X amino acid sequence. Some difference between my previous ChIP study and this one: 1) instead of a mouse cell model, it's a mouse liver. 2) I'm not using the same lysis buffers. 3) I'm preclearing the samples now before the IP, and I was not doing that for the cell model. About RNA: I'm sorry as I'm not trying to study any RNA in the present ChIP experiment. It's not a RNA-IP. I do use proteinase inhibotors as I want my NHR and coactivator X to remain intact. How do tandem integrations of transgene typically line up? Why is my Cre PCR data does not match the immunofluorescent-labeling?